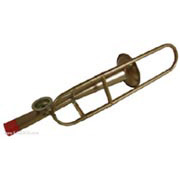 This metal Trombone kazoo is the perfect addition to your kazoo band. The slide actually works on this kazoo with a full two inches of travel, even though it does not affect the sound. Locked in cap for child safety. Comes packaged in white cardboard gift box. Made in the USA. 1" Long x 2.5" wide x 2.5" tall. Recommended for children over the age of three.